Chachapoyas is located in northeastern Peru, at an altitude of 2,335 mts. above sea level. Its name comes from the native word Chachapoyacuno, which means "forest or mountain of mist". The name Chachapoyas refers to the pre-Inca culture that dominated the region. The Chachapoyas People lived in stone cities on mountain ridges and the remains are there to be seen by visitors to the area. In fact the ruins are so numerous, the area is described as the richest archaeological zone in South America and possibly the world. 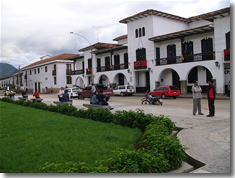 Chachapoyas, and has left some remarkable archaeological ruins in spectacular countryside. These include the impressive fortress of Kuélap and the extensive remains of Gran Vilaya, which archaeologist Gene Savoy has dedicated much of his life to studying. In Peru, the Chachapoyas left the greatest number of archaeological remains of any pre-Hispanic culture, bar the Incas, and there are approximately 600 around the town of Chachapoyas. It is likely that the Chachapoyas were not ruled by a single leader, but rather that the people were a confederation of small groups with similar linguistic and cultural heritage. The population of all the groups was probably between 300,000 and 530,000, according to the German historian Peter Lerche. The Chachapoyas came to prominence around 800AD, and were dominant in the region until they were conquered and assimilated by the Inca Pachacuteq around 1470. The culture continued to flourish until the Spanish conquest in 1532. 200 years after the conquest, 90% of the native population of the area had died out. The language of the Chachapoyas also disappeared, although there are theories that this had links with the Chibcha culture in Columbia. Alonso De Alvarado founded the city on September 5, 1538, and in colonial times it was the capital of eastern Peru, due to its being the starting point for expeditions setting out to conquer and colonize the Amazon. Not only impressive historical vestiges, Chachapoyas city is also famous because of the typical dances during it spectacular festivities, specially in Jalca town, known as the centre of the jungle folklore. Chachapoyas is an ecologically diverse area of high mountains, cloud forests, deep canyons, raging rivers and jungle.